When I was in culinary school, my favorite class/semester was our second level baking class. This is where we learned how to do sugar and chocolate art, make huge multi tiered wedding and party cakes, and create some of the tastiest desserts I had ever eaten. I went nuts. I loved every single day, and as the difficulty of the dish increased over the semester and the ingredients got weirder, the more excited I became! Two whole weeks were spent on 5 Star fine dining plated desserts- where we learned all about how to properly compose a plate. You know, so it looked the best. Things like height, structure, flavors, amount of sauces to add, textures, etc were all drilled into our plating minds. Every plate we ever made and presented to the chef instructors had to have the perfect balance of all of these components in order to pass. LOVED IT! At the end of the first week, we spent a few days making ice creams and sorbets. Why? Because a single scoop (or quenelle) of freshly made sorbet or ice cream on top of an individual tart or torte can make anyone swoon. Fact. So that week, we were given the freedom to go crazy with their ridiculously stocked pantry, freezer, and fridges and create whatever flavored frozen treats we wanted. Gaaaaaaw I loved it! I was like a kid in a candy store (I guess almost literally! )- I tried to make some of the weirdest combos I could think of (that still made sense and tasted great). Some of my favorites included strawberry lemon basil sorbet and passionfruit guava sweet cream ice cream. Ahh to have that sort of ingredient inventory again! That was SO darn fun. Since that time in school, I've learned to continually push my flavor boundaries out when creating anything one can eat. Yes, there is certainly something romantic about the classic flavor combos, but when you combine two things that aren't normally paired AND THEY CREATE A SYMPHONY IN YOUR MOUTH??? Awesome to the max. Reminds me of that part in Ratatouille where Remy is explaining the importance of combining certain foods to create magic. I love that whole scene. Totally true! Two classic flavors combined to make something not so classic? Just as fun! 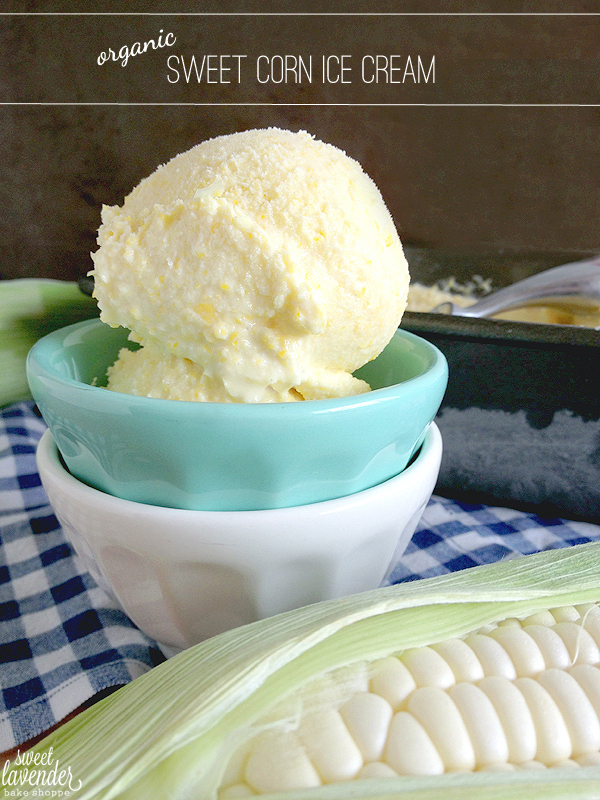 Which is why this Sweet Corn Ice Cream intrigued me to the core! When I first laid eyes on it in my Food Network magazine I smiled with delight! My husband and I LOVE corn! Seriously, who would have thought to take a BBQ and picnic summer staple, cook with sugar and cream, and make into a frozen treat? Heck yeah! 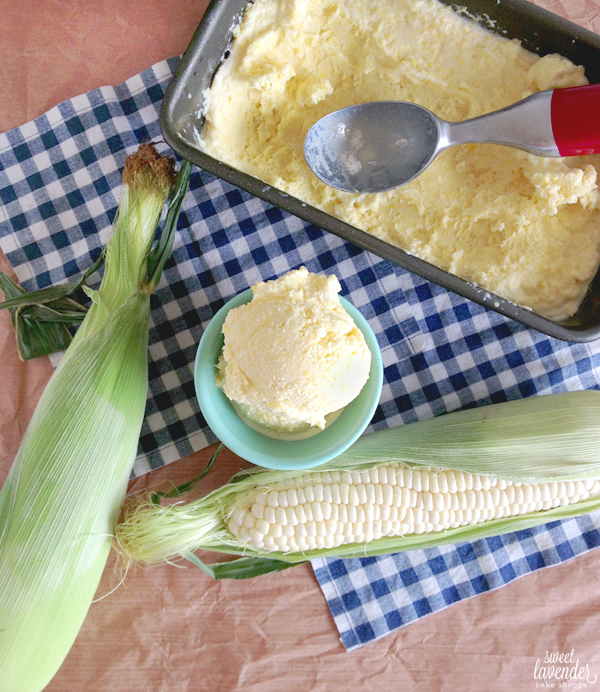 Plus, right now, being summer and all, corn is at it's finest and sweetest too! So it only made sense to make as soon as possible. I followed the steps pretty closely, so our ice cream was very textured with the chopped up corn kernels. Not a fan of textured ice cream? Strain it out! I'll explain how to do so later in the recipe's instructions. The flavor is exactly what you think it would be- corny! But...in like a totally sweet and delicious corn-should-always-be-an-ice-cream-flavor kind of way. I really think corn was made to involve sugar and cream. We loved this! Not just us too- I taste tested on a friend (who thought the idea of corn ice cream was just ridiculous) and he loved it! Laughed at it while eating, but devoured his serving and raved afterwards! Success! 1. In a medium sized sauce pot, over medium high heat, bring your defrosted corn, half & half, salt, and vanilla extract to a simmer. Once simmering, turn heat to medium low or low and allow to gently simmer and cook 5 minutes while stirring occasionally. Be sure to watch your pot- if it begins to boil your cream may boil over. 2. While this is cooking, set up an ice bath: a large bowl filled with ice and water, with another bowl (preferably glass or metal) inside. 3. Remove corn mixture from heat and allow to cool in pot for 5 minutes. 4. 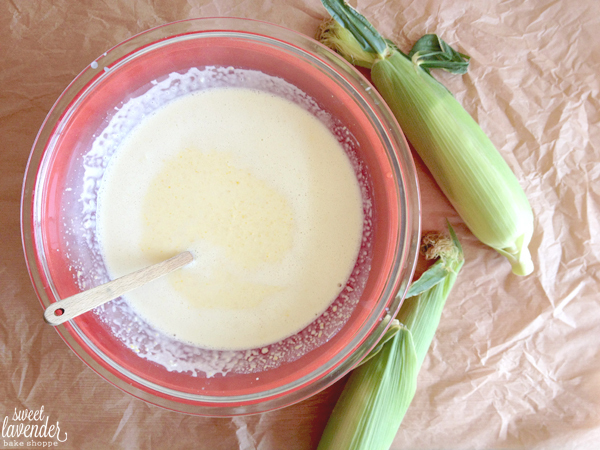 Carefully add corn mix to a blender or food processor and add in your sweetened condensed milk. Process and blend together until mixture is relatively smooth- about 1-2 minutes. You will still have very small pieces of corn. You can add your corn mixture straight into your ice bath and allow to chill, stirring occasionally- 20 minutes. You can pour corn mixture through a sieve or fine mesh strainer (catching any corn kernels) into your ice bath and allow to chill, stirring occasionally, as well- for about 20 minutes. This step is completely up to you. Like I stated earlier, we opted to NOT strain out the kernels- we like a little texture in our ice cream. If you're not a fan, and would prefer a completely smooth ice cream, strain the kernels out while pouring your ice cream base into your ice bath. Whatever choice you choose, make sure you completely cool your ice cream base, while stirring occasionally. This should take 20-25 minutes. My ice bath consisted of a large plastic bowl (red) filled with ice water and ice, and then a large glass bowl set inside. 6. 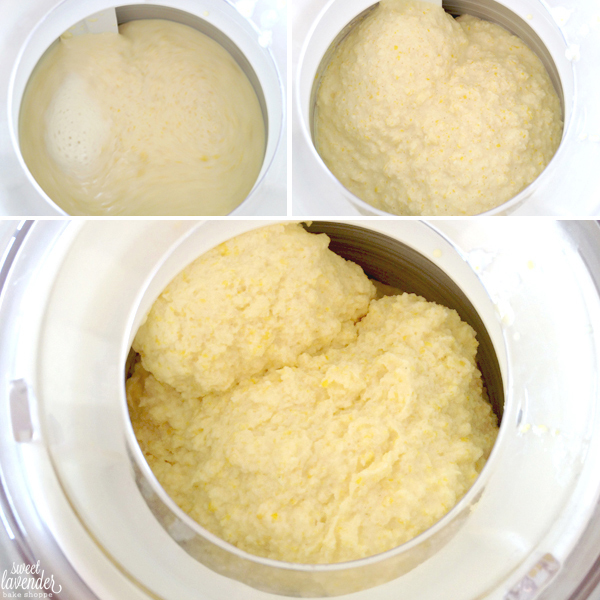 When your mixture is completely chilled, set up your ice cream maker according to your manufacturer's instructions. Always turn ice cream maker on before you pour ice cream base into a maker! 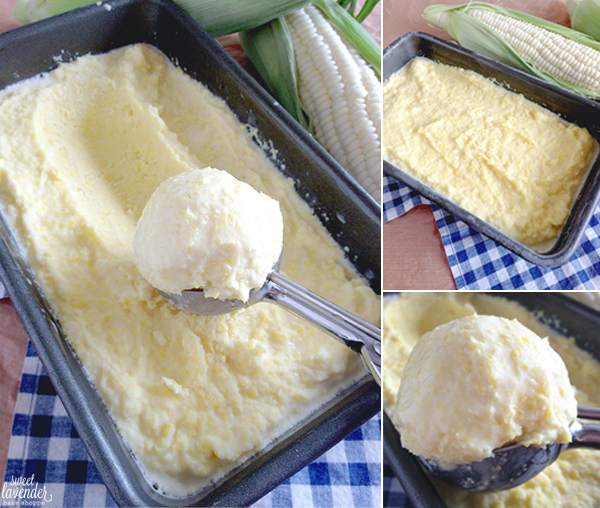 Pour chilled corn ice cream base into your maker and allow to churn until you reach a soft-serve/ice cream consistency! For my Cuisinart ice cream maker, this took about 25 minutes. 7. Once the ice cream is finished churning, scoop into a freezer proof air tight container and allow to set up in freezer until firm. Once ice cream has set up, scoop out and enjoy! I can't wait to try this again and see how it is with the kernels strained out. Might be even better! This ice cream sounds AMAZING!!!!!!!! Thank you for sharing the recipe! Nice and interesting recipe! Thanks for sharing!!! That looks fabulous Christina!! Corn is my favorite muffin flavor and soup flavor...and looks like soon to be ice cream flavor too!